Ultra comfort and warmth helps you focus on your performance or presentation. 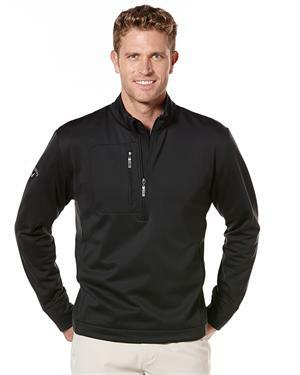 91% Polyester / 9% Spandex Fleece Pullover. Stretch Fabric. 1/4 Zip with Callaway Logo Zipper Pull. Right Chest Pocket with Callaway Logo Zipper Pull. Banded Cuffs. Open Bottom with Drop Tail and Adjustable Toggles. Thermal Insulation. Heat Transfer Callaway Logo on Right Sleeve.